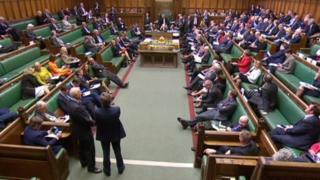 MPs are debating the possible next steps for Brexit as they try to break the deadlock in Parliament. Labour MPs are being urged to back a plan to keep the UK in a Norway-style relationship with the EU. Under the Common Market 2.0 proposal, the UK would leave the EU, but retain freedom of movement and make contributions to the EU Budget. Conservative MPs are being given a free vote on the motions – meaning they will not be told by party bosses which way to go – but the cabinet has been told to abstain. During the debate, 11 climate change activists staged a protest in the public gallery, taking their clothes off to reveal slogans painted on their bodies. Police were called to remove them from the viewing platform. The Common Market 2.0 motion – put forward by Tory MP Nick Boles – may also be backed by the SNP. But the PM’s spokesman said ending free movement was a “very important factor” for the public when voting for Brexit, so they would oppose it. Shadow foreign secretary Emily Thornberry, speaking to the BBC’s World at One programme, refused to say whether Labour’s position on free movement had changed. When asked if she was compromising on freedom of movement, she said “we are trying to pull the House of Commons together”. None of today’s votes on the proposals are legally binding, meaning it will be up to the government if they act on the results. Theresa May tried to get MPs to back the withdrawal agreement element of her deal on Friday, but lost by 58 votes – having already failed twice to get support for her overall deal in Parliament. She now has until 12 April to either seek a longer extension to the deadline or decide to leave the EU without a deal. The cabinet is now split over whether to move to a softer deal that could mean including a customs union in her plan. International Trade Secretary Liam Fox told the BBC joining a customs union would be a “betrayal of Brexit”. How will the rest of the day unfold? The Commons started with MPs debating and voting on a business motion that laid out plans for the votes later and set aside time for any next steps on Wednesday. It was approved by 322 votes to 277. The Speaker John Bercow then decided which motions to take forward for MPs to vote on tonight. He did not choose motions calling for a unilateral exit to the backstop, to leave on 12 April without a deal, to hold a referendum in the case of no-deal or to rejoin the European Free Trade Association. You can read more about the proposals here. MPs are now debating the proposals until 20:00 BST, after which – as with the indicative votes last week – MPs will be given a piece of paper listing all the options and tick “yes” or “no” on as many as they want. The House will be suspended for 30 minutes to allow the votes to take place. It took two hours for the votes to be counted before, so the result could be around 22:00 BST. Will any of the options get a majority? When MPs voted on proposals last week, all eight failed to win a majority in the Commons. 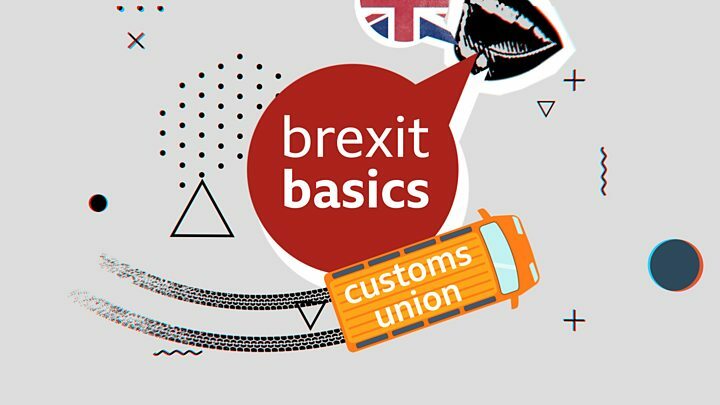 However, the plan for a customs union – allowing UK businesses to move goods around the EU without tariffs, but stopping the UK striking independent trade deals – and a confirmatory referendum came the closest. A number of cabinet ministers have spoken out against the customs union proposal. Environment Secretary Michael Gove said a customs union would “compromise” pledges the party made in their 2017 manifesto, while Defence Secretary Gavin Williamson said ministers were “determined” to avoid that happening. Meanwhile, Tory MP Huw Merriman has written to around 200 of his colleagues who have voted in favour of Mrs May’s deal, appealing for them to back the confirmatory referendum motion to prevent the customs union option succeeding. Digital Minister Margot James also told BBC Two’s Politics Live that she is thinking about changing her mind to back a confirmatory referendum. Labour’s Dame Margaret Beckett, who proposed the previous motion for a confirmatory public vote, said she was happy to vote for motions like a customs union, so it could attract scrutiny. “But they’re unlikely to command a stable majority in Parliament unless they are attached to much longer extension that allows enough time for them to be properly scrutinised and negotiated – while not precluding a new public vote,” she said.